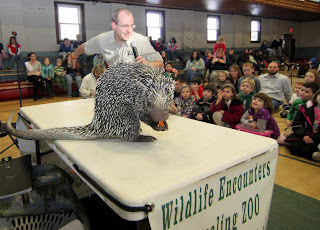 A monkey-tailed porcupine snacks on sweet potato during a wild animal demonstration by Wildlife Encounters. 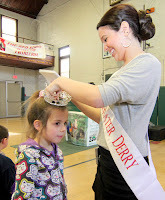 DERRY – As the snow continued to melt away under yesterday's warm, sunny skies, residents made the best of the De-Frost Fest – the unofficial new name for the town's 11th annual celebration of wintry family fun. Instead of the much-anticipated snowboard competition at Alexander-Carr Park and snowmobile demonstrations at Hoodkroft Golf Course, families flocked to Veteran's Hall for an afternoon of free indoor activity. 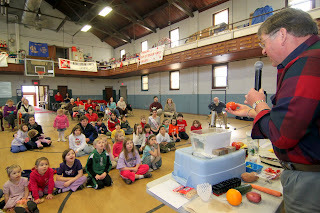 Retired science teacher Gordon Corbett of Maine, who was also a candidate for Teachers in Space in 1985 along with his New Hampshire counterpart, Christa McAuliffe, used storytelling and hands-on demonstrations to teach the kids about the positive buoyancy of bananas – and other fruits and vegetables – and how the Titanic might not have sunk if only a good science teacher had been on board. After dropping a large tomato into a tank of water and watching it float, Corbett dropped in a second, smaller and riper tomato, which sank to the bottom of the tank. “How is that possible?” gasped one little girl in the front row. He then switched gears, using a model of the Titanic to launch into a lengthy demonstration on the science of sinking ships. Earlier in the day families were finding their way to Ernest P. Barka Elementary School, where the gym had been transformed into a mini-golf course/dance party. 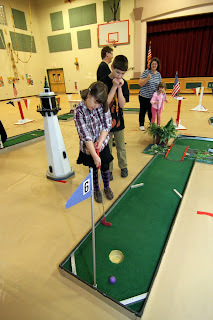 The Puttin' Families First Mini Golf Tournament was not officially part of Frost Fest, but when it was clear there would not be enough snow to sustain outdoor activities, the Upper Room extended an invitation to the community at large to join in the fun. Inside, Alex Fellows, 12, was giving his younger brother Josh, 8, a hard time as he missed a shot on the 8th hole. Kayleigh Younie, 7, rocked out to a little “Can't Get Enough of Your Love,” by Barry White, courtesy of Get Down Tonight Entertainment, while her sister Heather, 8, labored over a tough shot on the 6th hole. Yesterday's schedule concluded with the Frost Ball at Promises to Keep, which included a Valentine's Day dinner, dessert and dancing for $35 per person. 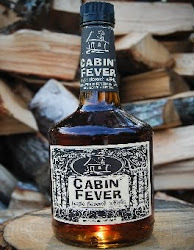 Frost Fest continues today at Gallien's Town Beach from noon to 4 p.m. as the Beaver Lake Association offers and ice fishing clinic and chili contest – and a modified version of yesterday's postponed snowmobile demonstrations will take place. Donations made for chili sampling benefit the Sonshine Soup Kitchen. 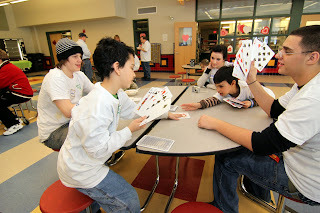 While there, families are welcome to enjoy open skating and ice hockey – but it's bring your own equipment. Crowning of the Frost Fest King and Queen will take place from 2 to 3 p.m.
Across town Ice Breakers ice sculptors will be posted outside The Depot Square Steakhouse between 11 a.m. and 4 p.m.creating some incredible ice art, and free hot chocolate will be served.